Autumn may be here, but Nymans Garden in West Sussex is looking stunning and I spent several hours ogling the plants there yesterday, enjoying a clear blue sky, weak, but warming sunshine and glorious autumn light. The leaves on the trees may be changing colour, but the borders are truly spectacular, and the rose garden - with is amazing scents - is still in bloom. 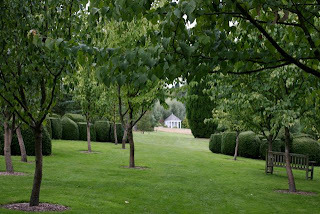 The garden was conceived by Ludwig Messel at the end of the 19th century, and his sponsorship of some of the great Himalayan plant hunters in the early 20th century ensured that there were specimens planted here that had not been seen before in Europe. Two successive generations of Messels turned Nymans into a magnificent plantsmans garden which draws visitors from far and wide. But it has not been without its share of tragedy and in 1947 a large part of the house, including an irreplacable library of botanical books, was destroyed by fire. Today, that part of the building makes an impressive backdrop for spectacular plants (above). Forty years later - in 1987 - Nymans was struck by tragedy again when south-east England was hit by hurricane force winds, and nearly 500 trees were felled in the storm. The property was vulnerable because of its hilltop position and one major casualty was the Pinetum conceived by the garden's founder. But today, it still commands much attention as an avenue with a "prospect" at the end (right). There are many outstanding features at Nymans and you can spend many hours strolling through the varied grounds, which include a heather garden, sunk garden with an Istrian marble urn as its centrepiece (above) a wisteria-clad pergola and an exceptional walled garden, where the central fountain, the statuary, the monumental yew topiaries and the borders will leave you breathless. 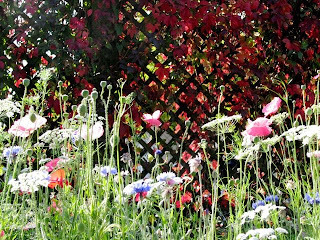 This is a garden to savour, to wander slowly round and to enjoy - it is exceptionally fine in spring with the early bulbs and bluebells are in flower, and in autumn when the leaves are changing and the borders are a riot of colour. 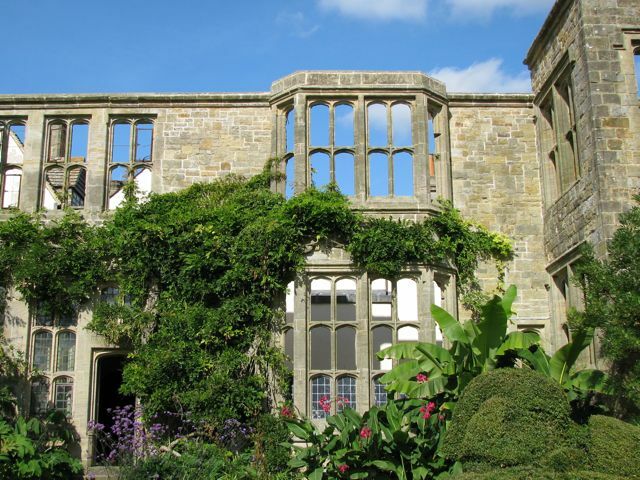 Nymans was one of the first properties to be bequeathed to the National Trust back in 1954, and it is one of their finest! 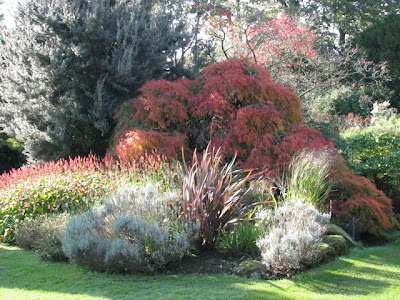 Combine this with a visit to two other neighbouring properties with magnificent tree collections - Leonardslee and High Beeches - and your autumn day out will be one to remember! Well Charlotte, you have once again shared a wonderful garden with us. Having 500 trees downed in a storm really changes the look of a garden. Thank goodness for the National Trust. A great treasure to be sure. 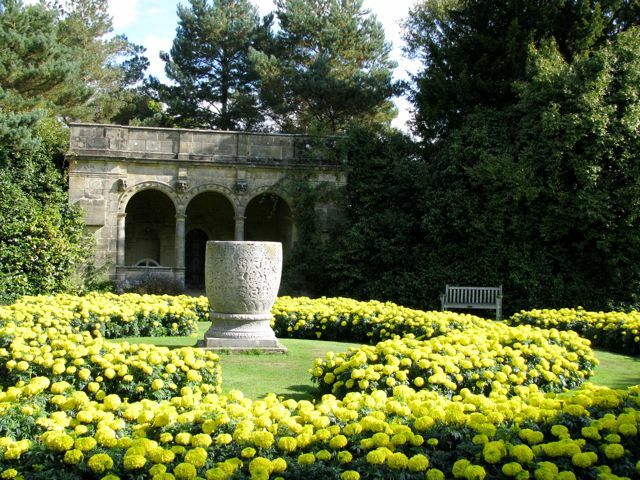 What a beautiful riot of yellow in the circular bed. Just gorgeous. And how in the world do they trim hedges to look like that.Maybe practice makes perfect. It is amazing anyway. What a wonderful experience you have of visiting so many wonderful gardens. What beautiful photos. 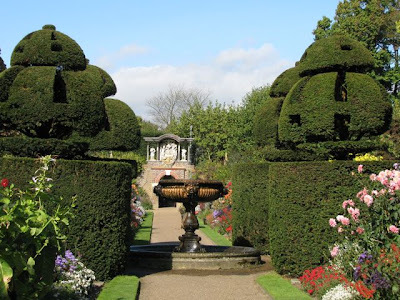 I especially like the intricately shaped topiary. Thank you for sharing. The walled garden looks stunning. I'd have like to see the heather garden. All that heather color, one of my favorite shades. Really nice garden. My goodness I feel underdressed just reading this. Of course that could be said of most of my activities. These are beautiful grounds. What a special treat to visit them! Thanks I enjoyed revisiting Nymans with you. What a really beautiful and interesting place. Those topiaries are something else. I also enjoyed reading about your U.S. garden visits. You are so lucky to see all of these wonderful places! The topiary is amazing. If it weren't for your galloping I would never have known the man-nature made marvels that exist on our planet.